Please mark your calendars! 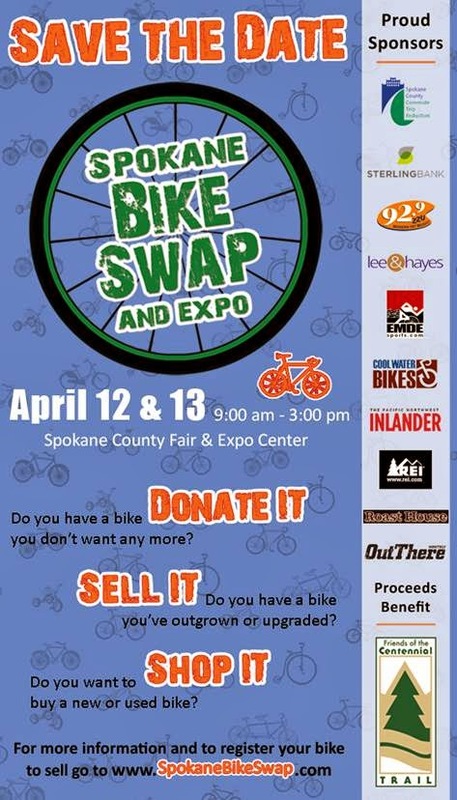 The Spokane Bike Swap is right around the corner on April 12 & 13. This is a great opportunity to get you pedaling this spring. And with May being Bike to Work Month, this is a perfect time to go check out hundreds of new and used bikes all in one place. The Spokane Bike Swap Team needs to fill approximately 230 volunteer positions to ensure the success of this great community event. If you are able to volunteer, please click here. There is a summary of the volunteer positions and a sign up form. New this year! Volunteers will received an official bike swap t-shirt when they arrive for their first shift. Plus you can enjoy FREE David’s Pizza at the volunteer night onWednesday April 9. If you have any questions or need additional information, please see me or go to the Spokane Bike Swap website atwww.SpokaneBikeSwap.com.